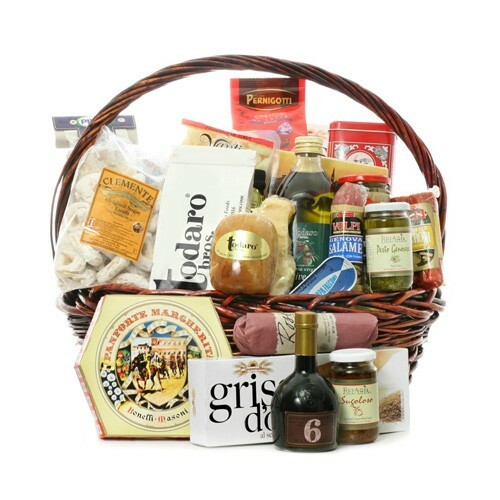 From antipasto to dolce, The Italian Feast gift basket is a breathtaking banquet of the world’s finest imported delicacies. This spectacular basket has everything that will make an unforgettable gift leaving a magnificent impression on the food lover. It includes panettone; Perugina chocolates; biscotti; torrone; ammarettini; assorted pastas; salami; pepperoni; sopressata; arborio rice; extra virgin olive oil; balsamic vinegar; breadsticks; sun-dried tomatoes; garlic; porcini mushrooms; tomato sauce; pesto alla Genovese; olive paste; roasted peppers; smoked mozzarella; a tube of sun-dried tomato paste; Parmigiano Reggiano cheese; imported provolone; and fruits in liqueur. Be careful, you'll have a friend for life! Occasionally substitutions of equal value must be made but the theme of the basket is always consistent.